Are Equity Markets Overbought ? There has been some talks about the equity markets being overbought as an explanation to the recent bout of volatility, so I thought I would put the recent moves in perspective. For doing so I have written a small script in R that downloads the main stock market indices from the YahooFinance Website and then estimates the T-Statistics of their daily returns over various time windows, namely 1 week, 1,3 and 6 months. The T Statistic tells us if the move observed over a given period was “normal” or not. The critical threshold used in the analysis is 95% , i.e we can reject the null hypothesis 95% of the time assuming the underlying has a normal distribution. Clearly financial markets are not normal and there are limitations to such a test, however it is my experience that it gives an information which is probably more reliable than what you would get from an RSI or any other technical indicators. 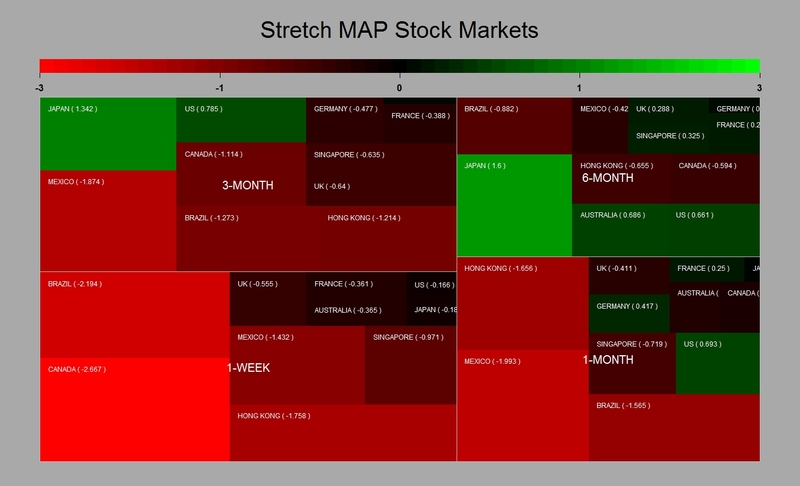 The results are visualized in what I call a “stretch map”. There is one section for each time period and the size of the squares are a function of the level of the T-Stat (the bigger the T-stat the bigger the square). The map is colour coded , red for downside, green for upside. It therefore provides an easy way to spot abnormalities. 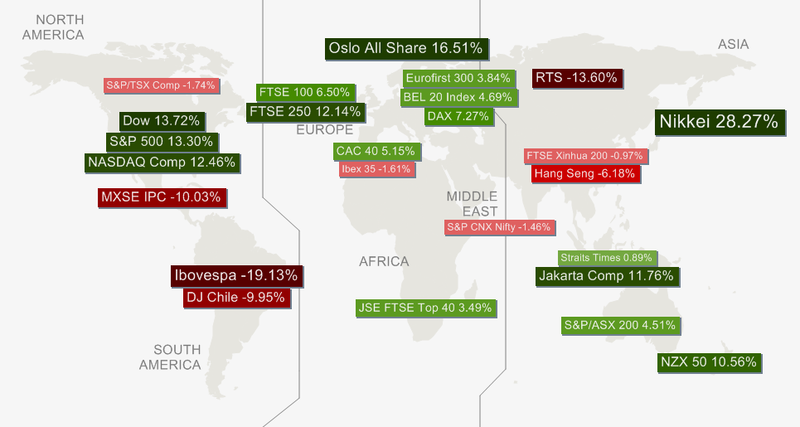 The map reflects well the fact that markets have been somehow sold over the last month and most particularly the like of Canada, Brazil,Mexico and Hong Kong. So it seems that is is more an EM story than a G10 one. 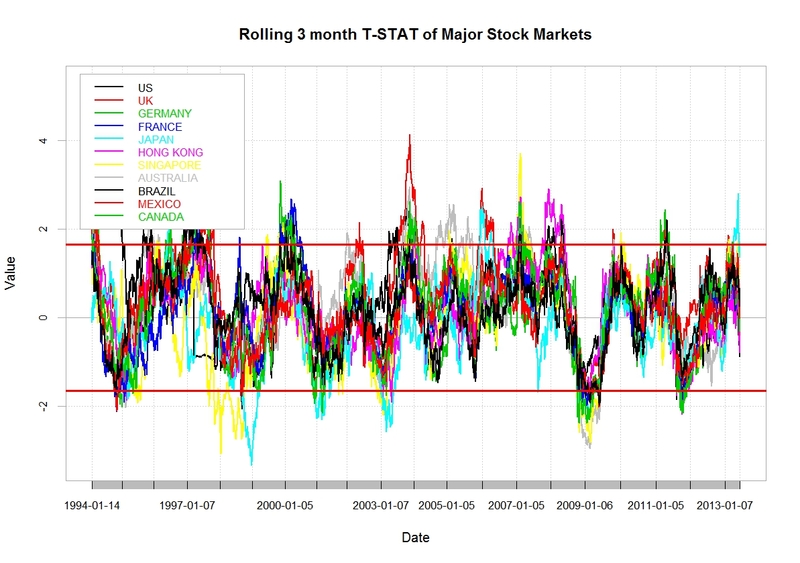 Also when we look at the 3-month Rolling T-Stats of the stock indices it seems that none are currently in an extended territory (oversold or overbought). The Nikkei was the only one recently to venture in what I would define as an overbought territory but it since has retraced somehow whilst preserving most of the gains delivered since the beginning of the year as can be seen from the FT Macro Map that shows the 6-month performance of major stock indices. Posted in Stock Market and tagged business, economy on June 17, 2013 by Pierre.